Leiny and I had breakfast out doors this morning. She is busy creating and must have all her work ready for assessment by Thursday next. I have been working on the wedding favors for Mel's wedding,she is visiting us next Wednesday and we are having the bridal shower next weekend. We were both glad of a restful morning and a little bit of sunshine. By afternoon we were both in need of a half hour break and it was raining, it did not dampen our spirits and we took a nice walk and admired the flower buds on the peony tree. Thank you Louise you are a wonderful host. I have won a special Award, the Gift of the Gab designed and bestowed by Pam at White O Morn Cottage, Thank you very much Pam, your own velvet tones are very evident in your posts. Mummy Boo Bear at Stitchery Pokery awarded me the lemonade Award, it conjures up images of warm sunny evenings on the promenade. Thank you very much Mummy Boo Bear, much appreciated. My dear friend Sharon at Manamoon studios saw fit to honour me with the Karma Award, Thank you very much Sharon. Indali's Delight to wear to my daughters wedding from her Etsy Shop. It arrived in all its splendor and is waiting for its grand unveiling. Sharon is soon going for surgery and I want to wish her all the very best and a speedy recovery. I was the lucky winner of The Whispering Poppies 400 post giveaway last month and Louise packed and posted this beautiful lavender purse with antique lace, button and photo as my prize. I am honoured to now have one of her amazing creations here in my home. Thank you very much Louise. 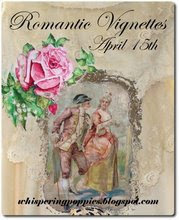 Louise is hosting a Romantic Vignettes Party on April 15th, you are all invited. Leiny,Rommeij, Mr. Margie and I all enjoyed a fresh fruit, fresh eggs and chocolate breakfast this morning. I hope your Easter festivities went well. I now have the task of bestowing the awards to other worthy blogs. This could take some time as I love so many blogs and find it difficult to narrow down the list. Yesterday Leiny and I put out some of the Easter decorations, I found the cutest pink feather boa with glitter eggs along the length. I really wanted to wear it but it looked much better in the living room. Those Crazy Chickens made a comeback again this year, who knows what they will get up to this time. We took Maurice (Morris Minor) out for a spin, with the Kath Kidston rug Mel purchased especially for those picnic trips. This kitchen dresser I call the blue one and it holds the jug collection, plates, glasses and dinner service. Mr Margie put it together thirteen years ago from recycled marine ply kitchen cupboards. I painted it about five years ago and made a cardboard stencil to put the baskets on the doors. This kitchen dresser, the green one, holds all the dried food and has an eclectic mix of keepsakes, photos and reference books on birds. It too is recycled from an yellow sideboard (you can see some of the old yellow paint coming through the green on the left side), Mr Margie worked his magic again and made the shelves for the top. Happy Easter, I hope you all enjoy the weekend.